Taiyang Island (太阳岛, Sunshine Island) is an island of 38 square kilometers in the north of the Zhonghua River, and the entire island is a park. In Harbin, you can take a boat ride from Stalin Park or take a cable car connecting the two riversides. Since it was built as a high-class resort in the Russian era, there are still Russian villas that have been built. Today, the island has been developed into a gigantic resort area with gardens, forests and water world. In summer, the forests are plentiful and various kinds of flowers bloom. In winter, snow sculptures exhibitions are held. To the back of the island is the Tohoku Tiger Forest, the world's largest Northeast Tiger Nature Park. St. Sophia's Cathedral is a Russian Orthodox cathedral in Harbin, typical Byzantine style building. It is 53.35m in height, 721m in area, and accommodates 2,000 people. It is one of the largest cathedrals in East Asia. In 1903, the 4th infantry unit of East Siberia of Russia entered Harbin, and it was built as a wooden for use as a war chapel. It has been expanding and reconstructing for 9 years from 1923, In 1997, the inside of the cathedral was restored to its former shape and changed its name to "Harbin Museum of Art". It is well known as the representative building of Harbin which boasts an old-fashioned and elegant shape. In 1986, the People's Government of Harbin designated the St. Sophia Cathedral as the first-class protected building, and in 1996, it was designated as the protection center for China. The surrounding area, including the cathedral, the square around the cathedral, and the nearby central Chongqiao Street, has undergone environmental remodeling, and visitors to Harbin as well as locals have come to visit. Inside the cathedral are pictures of Harbin's history, feeds, and the last supper of the sanctuary. The night view is also very beautiful. 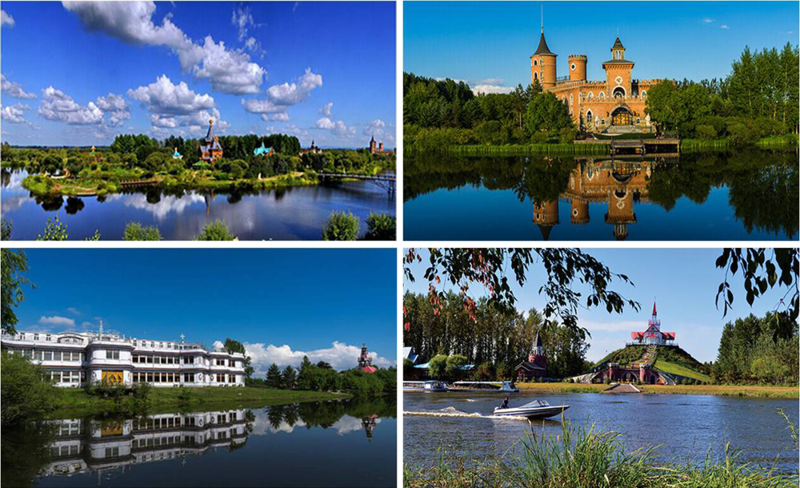 Volga Manor is located on the banks of the Ash River in the suburbs of Harbin. It covers an area of more than 600,000 square meters. 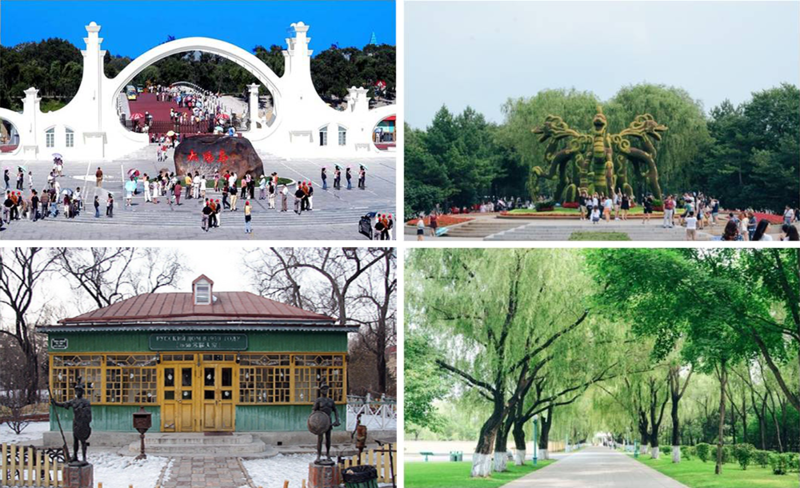 It is based on the history of Harbin, the national AAAA cultural tourism scenic spot with the theme of Russian culture, the Sino-Russian cultural exchange base, the Russian Artists Association creative base, Moscow. University International Exchange Center. The manor advocates the business philosophy of “having culture in the long-term, and having taste and value”. The restored St. Nicholas Church and the riverside restaurant carry the memories of the old Harbin people; the Petrov Art Palace and the Pushkin Salon provide culture and art. A platform for communication; a cultural resort for tourists, a holiday estate. The manor can accommodate 1,000 people and 600 people at the same time, providing quality services for leisure vacations, conferences and exhibitions, study tours, innovative education, wedding celebrations, outdoor sports and other projects. Haibin Dongbei Furin Yuan (Tohoku Tiger Forest) is a place where you can see the endangered Siberian tiger. It is the largest tiger breeding base in northeast China, with a research center and ecological park to preserve the species of tiger that has already become extinct in Korea and has become a rare animal worldwide because of its small population. It has a total area of ​​1.44 million square meters and is home to a variety of cats and beasts, including the purebred tribal tiger. It is also a breeding breeding base of the Heilongjiang Northeast Tiger, designated by the Chinese national government.